The Orioles are on fire. To be fair, they have played the most home games (44) and fewest road games (31) of anyone in baseball, and are about to embark on a nine-game, West Coast roadtrip. But they are making the most of it, with a robust 31-13 record at Camden Yards. The Red Sox are scuffling of late, having dropped nine of 14, and the Blue Jays have been middling as well, as Baltimore has built a four-game lead. So will the current landscape look the same way at the end of September? It just might, because this Orioles team is for real. They could very well set the Major League record for home runs in a season, but power is not the only thing that defines this club. The Orioles are an elite defensive team, as that facet has literally won games for them this year (see: Adam Jones’ full-sprawl, diving catch in center on Saturday night that saved three runs and kept the deficit at a manageable four). Their bullpen is more than able to pick up the slack for an average rotation, which may or may not get reinforcements later this summer depending on how GM Dan Duquette views the quality of the starting pitching market. As for the Red Sox, they aren’t going away, either. They are the highest-scoring offense in baseball and that is no fluke. Like Baltimore, Boston needs rotation help. David Price’s struggles are not as easy to dismiss in June as they were in April. The bullpen has been solid if not spectacular, with Heath Hembree emerging as one of the unsung heroes while the name guys like Craig Kimbrel and Koji Uehara are having mediocre seasons (by their standards, anyway). And the Blue Jays? Don’t count them out by any stretch. Their Achilles’ heel is the bullpen, although we are starting to see the rotation come back to earth a little bit. If Marcus Stroman can’t get back to form, that could have a ripple effect on the rest of the rotation. Scoring runs won’t be a problem, and just imagine if they can get something – anything – from Troy Tulowitzki. Fun fact: since the Cavaliers ended Cleveland’s 52-year title drought, both the Indians and Browns are undefeated (okay, so the NFL doesn’t start for more than two months, but still…). The Indians, winners of nine straight, have the AL’s best run-differential at plus-81. The bullpen isn’t great, but with the way the offense is rolling (in the absence of Michael Brantley, no less) and the quality of the starting rotation, it hasn’t had to be. The Tribe will be in the market for relief corps upgrades at the deadline. There is no reason to believe Cleveland can’t run away and hide in the Central, because of the Jekyll-and-Hyde nature of this year’s Royals (MLB-best 26-10 at home, 13-25 on the road) and major inconsistencies of the Tigers and White Sox. Detroit is a real head-scratcher. We know the bullpen is a liability, but the Tigers’ lineup is one of the best in baseball despite the absence of J.D. Martinez. The rotation will be made or broken on Justin Verlander, who had been great but looked awful yesterday against Cleveland. Realistically, the Tigers’ best hopes for October baseball will be as a wild card entrant. The White Sox got a mini boost after a dreadful stretch, going 5-2 against the Red Sox and Blue Jays this week. But like Detroit, Chicago doesn’t figure to contend for the Central crown. The Royals may be Cleveland’s only competition, but they need to learn to win on the road (understatement of the year). So much for the other shoe dropping for Texas. After a glittering run, the Rangers looked to be in trouble when two more members of their rotation joined Yu Darvish on the disabled list. And after an absolute gut-punch loss on Friday against Boston when the Sam Dyson-less bullpen squandered a three-run lead in the ninth, all the Rangers did was rebound to win the next two against the Sox by a combined count of 16-5. The Rangers – not the Cubs – own baseball’s biggest division lead at 10 games, even as the Astros have been white-hot during a 22-9 stretch. This division looks like a one-man show, but the Astros are now fully entrenched in the wild card hunt and will be buyers at the deadline. On the other hand, it’s hard to figure out which direction the Mariners are headed in. Injuries are catching up to Seattle, which despite being 38-38 has a plus-43 run-differential. The M’s desperately need healthy returns from rotation aces Felix Hernandez, Wade Miley, and Taijuan Walker. How interesting things have gotten here. The Nationals invited the Mets and, shockingly, the Marlins back into contention with a seven-game losing streak that nearly became eight yesterday during Jayson Werth’s battles with the sun. The Mets head to DC for a three-game set with the Nats trailing by three games. This will be a telling week as the Nats need to rebound against the Mets and then the lowly Reds as the bullpen struggles to figure things out in Jonathan Papelbon’s absence. The Marlins aren’t supposed to be here, but why can’t they stay in the race? A simple, two-word answer to that question: Jose Fernandez. Can we stop acting like Fernandez will be available at the July 31 non-waiver trade deadline? My preseason NL Cy Young pick is right on schedule, even with the rest of the rotation being pedestrian. A.J. Ramos is second in the league in saves and has been perfect in 24 opportunities. He also hasn’t walked a batter in his last six outings, a good sign considered he issued 18 free passes in his first 27 appearances. If Giancarlo Stanton (.220/.318/.444) can even bring his numbers up a little bit, this team can hang around for a while and contend for the first division title (yes, that’s correct despite two World Series crowns) in franchise history. I can’t speak for everyone, except pretty much all of Cardinal Nation, when I say that it just feels that at any moment St. Louis is ready to go on a tear. If you can overlook their 39-35 record for a moment, you’ll see that this team has baseball’s second-best road record (24-14), the most runs scored in the National League (392), and a plus-75 run-differential (second in the league only to the Cubs). The problem is that their ticket to a run at another National League pennant will likely have to be via the wild card route. A nine-game deficit is not insurmountable, but unless the Cubs’ recent woes (1-6 in their last seven) stretch further, making up ground during a summer when both clubs have the benefit of playing a heap of games against the Brewers and Reds will be difficult. St. Louis’ lineup is more potent than that of the Cubs, and Aledmys Diaz may be headed for a Rookie of the Year award. The Cubs have the rotation edge, and the Cardinals’ bullpen is in transition after Trevor Rosenthal was removed from the closer role. But after sweeping the Cubs at Wrigley for the first time since 1988 this past week, Chicago is on notice that the three-time defending division champs won’t go away easy. The question is whether the same can be said for the Pirates, who are struggling just to tread water without key players like Gerrit Cole and Francisco Cervelli. The Giants are absolutely steamrolling. They are 32-10 over their last 42 games, opening up an eight-game lead heading into today’s games. And this is all without Hunter Pence or Sergio Romo. No manager in the game manipulates a 162-game schedule like Bruce Bochy, and the Giants are probably the last team anyone wants to face come October given their recent success. Though the Dodgers will certainly contend for a Wild Card spot, really, Bochy can manage the rest of this season with relative caution given the porous state of the other three NL West teams. That doesn’t mean he’ll take it easy one bit, but he certainly doesn’t need to overwork his star players like Buster Posey and Madison Bumgarner. The Dodgers will benefit from looming healthy returns of pitchers Hyun-Jin Ryu, Brandon McCarthy, and Alex Wood, but they can’t be considered an elite team without another top-flight starter or set-up man. 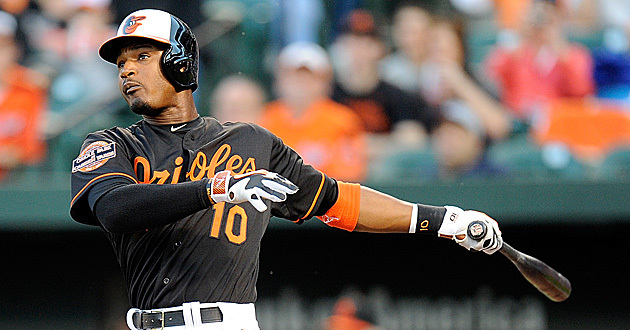 Be the first to comment on "MLB Week 12 Roundup: Orioles Enjoying Home Cooking"